The average person takes between 2,000 and 2,500 walking steps per mile as counted by a pedometer, fitness band, or your phone's motion sensor. Running steps have a longer stride length and you may take between 1,400 and 1,700 steps per mile. A total of 10,000 steps equals 4 to 5 miles. 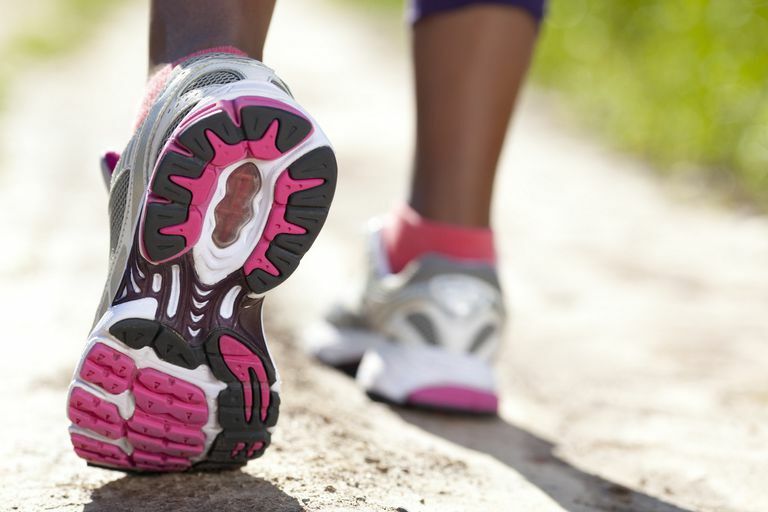 The number of steps per mile varies from person to person and depends on your stride length. See ways to estimate your typical steps per mile. Using these averages, here is how far you might go using various step totals. The best way to find your average steps per mile is to count them several times over a course of a known distance and find your own average. You can use a step-counting pedometer or the pedometer function of your mobile phone to count your steps, or you can count them in your head. Track: To find a measured mile, you can use a regulation quarter-mile track at a local school. You may have to ask the coach to ensure it is a quarter-mile track (1,320 feet) rather than a 400-meter track (1,308 feet). Walk in the inside lane only. Count your steps. It's best to go around four times to get a full mile on a quarter-mile track, so you won't need to do any math. For a 400 meter track, go around four times and multiply your steps by 1.009. Football Field: A football field is 300 feet from goal line to goal line. Count your steps as you walk or run at your usual pace from goal line to goal line. Multiply your steps by 17.6 to get your steps per mile. App: You can use a mobile app such as MapMyWalk that will count your steps and measure a mile with your phone's GPS at the same time. However, the mile distance can be off by 10 percent using GPS. For better accuracy, choose a place to walk that is in an open area with a clear view of the sky and no twists or turns. GPS signals travel between your phone and multiple satellites in orbit. They can get confused by buildings, trees, and hillsides, resulting in a less accurate distance measurement. Measured Mile: Another method is to use an online mapping site to map you a mile course in your local area, then walk it with a pedometer or pedometer app. For the best accuracy, choose a straight course without turns and curves. An average stride length that you will see listed in many places is 2.2 feet (0.67 meters) for women and 2.5 feet (0.762 meters) for men, but it depends very much on height. Measuring your stride length will give you a much more accurate number for your personal steps per mile. Your stride length is the distance is from the heel print of one foot to the heel print of the other foot. This is the distance traveled forward by a single leg. Your stride length varies depending on whether you are walking or running, and whether you are on hills or rough trails, or crossing streets with starts and stops. 5,280 divided by your stride length in feet. 63,360 divided by your stride length in inches. Most pedometers request that you enter your stride length during setup in order to calculate distance based on your step count. A pedometer takes the number you have entered as stride length and divides a mile by that number to calculate the distance you have walked. If you find that your pedometer is telling you that you have gone farther than a mile in a measured mile, then increase the stride length programmed in the pedometer. If it is telling you that you have gone less than a mile in a measured mile, then reduce your stride length programmed into the pedometer. For Fitbit fitness bands and pedometers, you can adjust your stride length via the Edit Profile function on the online Dashboard. In the Fitbit app, it can be set in the Account, Advanced Settings, Stride Length menu. You can set different lengths for walking and running strides. Fitness trackers you wear on your wrist may be counting arm motion rather than steps. Read the instructions to see how to set its sensitivity, so it isn't over-counting steps. Research says that wearing it on your non-dominate wrist is better for accuracy. For example, if you are right-handed, wear it on your left wrist. Your steps per mile will be inaccurate when wearing a wrist-based fitness tracker if you don't use arm motion, such as when you are holding onto the handrails of a treadmill or pushing a baby stroller. They may also be inaccurate when you are using trekking poles and not moving the poles every step. Knowing how many steps are typical for a mile, you can begin to envision how much you need to walk to log 10,000 steps per day on a pedometer. It also works in reverse. The miles might not seem so long if you realize how many you manage to log during your daily activities. Keep moving and you will make it to your daily goal. Barreira TV, Rowe DA, Kang M. Parameters of Walking and Jogging in Healthy Young Adults. International Journal of Exercise Science. Vol. 3 (2010) Iss. 1. Bassett DR, Toth LP, Lamunion SR, Crouter SE. Step Counting: A Review of Measurement Considerations and Health-Related Applications. Sports Medicine. 2016;47(7):1303-1315. Hoeger WK, Bond L, Ransdell L, Shimon JM, Merugu S. One-Mile Step Count at Walking and Running Speeds. ACSM’s Health & Fitness Journal, January/February 2008, Vol. 12, No. 1.